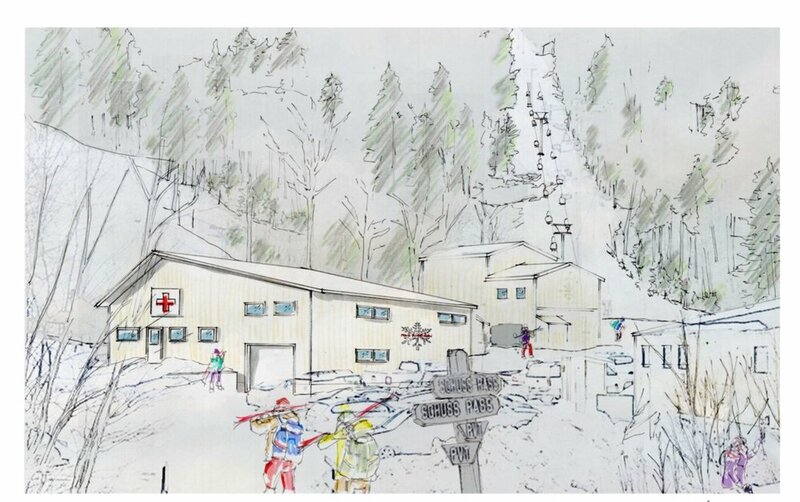 At the recent Mad River Glen Shareholder's meeting, the Facilities Committee showed preliminary conceptual drawings and renderings for the two largest projects that will be funded by the campaign, the Basebox renovations, and a rebuilt Patrol Building. The committee is currently working with Mad River's management and Vermont Integrated Architects to define the scope of work, develop preliminary cost estimates, and refine these conceptual drawings. Behind the scenes, our beloved Basebox is suffering from decades of deferred maintenance, and there is significant work required for fire safety, accessibility, and mechanical systems. The planning remains a work in progress and the actual scope of the projects will be determined in the coming months, depending upon the final total raised by the campaign and the ongoing work by the team. Key requirements that are being addressed include better traffic flow, additional bathrooms & gear storage, more efficient food operations, and energy efficiency. The exterior of the Basebox will show only modest changes, primarily to the northeast corner of the building, which will house an additional stairway to the second and third floors, as well as a code-mandated elevator. On the main level of the Basebox, the current food preparation room near the entrance will be removed, opening up the entrance area and allowing a window to the bar where drinks can be ordered. The current dish room will be replaced by two bathrooms and additional seating. A new fire exit will be added to General Stark's Pub. The kitchen will be reconfigured to be much more efficient and accommodate the moved areas. 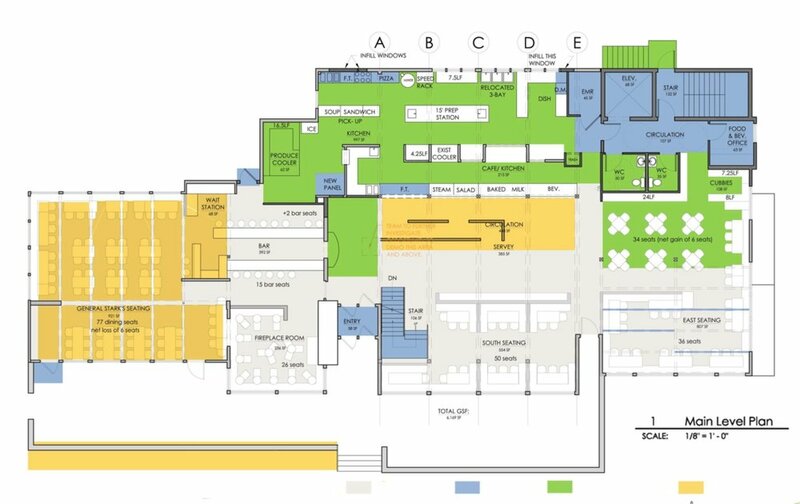 The blue areas indicate essential renovations mandated by code; green are elective areas that are currently deemed to be essential; and yellow indicates elective features that are desirable but would add to the current project cost. On this level, elective areas include removing the half wall by the cafeteria, and adding acoustic treatment to the Pub. On the basement level, the new elevator and stairway are shown on the top right. Essential structural work needs to be performed to the foundation on the left, as well as significant mechanical, plumbing & electrical work. Bathrooms would be remodeled and the entrance to the Ski School area widened. Expanding the kids lunch area is an elective which has received popular support. On the third floor, in addition to the new stairway and elevator, proposed elective elements include removing some of the existing half walls, adding a family bathroom, and removing an existing office to provide more seating space. This rendering of the proposed new Patrol Building shows a simple new structure on the same footprint and with a similar profile, but with a raised roof to provide more interior space. Our architects have determined it is more cost-effective to build a new structure than to renovate the existing building. The new building will enable a larger patient treatment area with an additional private treatment bed, as well as additional meeting and gear area for both the Patrol and the Ski School staff, while preserving the existing basement storage space. We still need to raise additional funds for both of these vital projects. Your help is needed! It’s not just the buildings! In addition to the building projects described above, there are several other significant projects left in the campaign. The biggest mountain project will be to upgrade the venerable 1967 Birdland lift with a new base terminal and other components as needed. Plus, we still need to replace one more grooming machine, wrap up the snowmaking improvements, and perform additional trail, glade, and drainage improvements. Your support is needed in these final days of the campaign!